The system, especially designed for urban combat, anti-terrorist operations and police SWAT operations, was developed by Pakistan Ordnance Factories. Chairman POF Board Lt Gen Syed Sabahat Husain told the visiting delegates at IDEAS 2008 that this new product of POF may meet the requirement of law enforcing agencies in order to curb the terrorist activities. The live demonstration of this gun was also shown to the delegates. According to one of the designers, Ashfaq Ahmad, the overall designing and finalizing of this gun took 6 months. Several domestic and international participants and delegates took keen interest in the newly introduced anti-terrorist weapon. Once the weapon is put into mass production, POF would take orders for its supply to prospective local and international buyers. Variations The POF Eye is available in several variations. 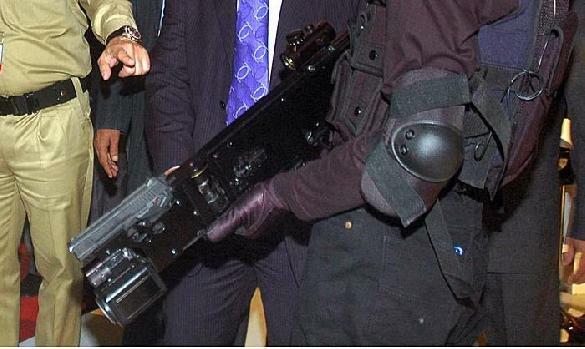 It can be mounted with standard 9mm semi-automatic pistol, sub-machine gun or grenade launcher. It includes a small high-resolution camera, laser sight and a colour LCD monitor, which can observe and view a target from various vantage points. The video camera enables forces to scan an area prior to pinpointing a target and broadcast the footage directly, in real time, to the operating team behind, or to a Command Post monitor. Its head can turn 75 degrees.